At the end of the kinematical section of his paper on special relativity, Einstein noted what he called a "peculiar consequence" stemming from his analysis - that of a time differential which would occur between reunited clocks. Over the course of his remaining fifty years, Einstein offered no explanation for that time differential (which came to be known as the twin paradox). Einstein's treatment was limited to assuming (thus assigning) symmetrical measures across inertial frames, such that his two postulates of measure would be satisfied. Einstein's paper was published in 1905. As the years passed, a point of view took hold among many commentators that these symmetrical measured effects of relativity were confirmation that uniform motion is purely relative, and that there is therefore no meaning to be attached to absolute uniform motion, and therefore of course, to actual differences in clock rates, etc. The actual time differential between reunited clocks, a physical reality which necessarily favors one party over the other, does not fit with that interpretation. As noted above, the actual time differential between reunited clocks, a physical reality which necessarily favors one party over the other, does not fit with a purely relative interpretation. Yet, countless commentators on special relativity have claimed to explain the time differential without acknowledging an actual difference in clock rates. 1. The "inertial force" or "acceleration" explanation. purely linear uniform motion considerations. 2. The "lines of simultaneity" space-time explanation. required to deduce the results of special relativity. independent of Einstein's clock synchronization. Space-time is a construct, entirely dependent for its existence on Einstein's particular (and entirely optional) method of clock synchronization. The best one can do with a space-time argument in the context of the twin paradox is to note that one party, when changing inertial frames, will observe a jump in the reading of the clock time of the other party, using the 'lattice of clocks' method dictated by Einstein's particular clock synchronization. But no such jump in anyone's aging (or identically on anyone's clock) actually occurs. You should re-read the previous two paragraphs, carefully. In contrast with the space-time argument: When the two parties check the status of each other's clock with the regular sending of radio pulses, they note an incrementally increasing time differential, first noted at the turn-around point. (More on that half way down this page.) That real-world experiment reveals the real incremental increase of time differential. [Luebeck, R. (2008, Sept 1). Relativity Trail. Space-time is a construct, dependent on an optional clock synchronization method, and generates a false jump in time reading. Space itself is not a construct, nor is time-keeping. And a real-world experiment reveals a real-world incremental increase in the time differential. Why should we expect anything different? The 'stay-at-home' twin does not age several years in a twinkling just because some distant inbound astronaut starts his watch as he passes an outbound astronaut. It is precisely ones motion with respect to the universe that dictates that party's actual clock rate, resulting in the actual time differential upon reuniting with the other party. You should re-read the previous paragraphs, carefully. 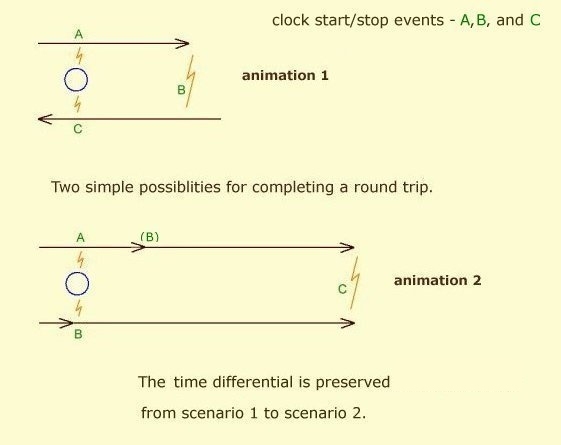 Einstein's clock synchronization method creates a pseudo reality for two inertial frames, whereby the parties of different inertial frames are free to reach opposing conclusions about what distant events are simultaneous. In reality, no one should conclude anything about what is simultaneous, as we know that our perceptions of distant events are constrained by the speed of light. Einstein's clock synchronization (tB - tA = t'A - tB) has the "jump in time" built in for any situation involving a change of inertial frame. It is in a space-time diagram that we find the infamous sudden shift of a line of simultaneity. 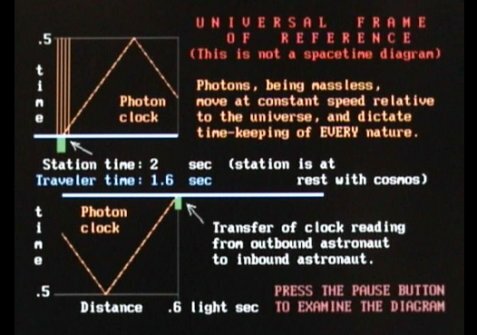 The further away (or the higher the overall speed) the "inbound" and "outbound" astronauts are from the "stay-at-home" when the transfer of clock information occurs, the greater the magnitude of the "jump in time" - the so called "misperception" explanation of space-time diagrams. Space-time, being dependent on Einstein's clock synchronization, is nothing but a geometrical construct that has no physical reality. Identically, there is no actual "world line" along which someone travels. Space-time, identically with Einstein's clock synchronization, is limited to the symmetrical observations made across inertial frames. It cannot address the time differential between reunited clocks. Note that the purely relative approach incorporates a hopelessly circular definition of inertial frame. In Spacetime & Electromagnetism, Lucas and Hodgson, using the space-time paradigm, wrestle with the twin paradox for fifteen pages, and claim no resolution. That alternative diagramming of the situation is identical to the consideration that one might just as well consider that it is the Earth, along with the entire cosmos, that changes inertial frames. That, in fact, is something we hear often from commentators on the twin paradox. Of course, that simply makes the twin paradox unresolvable, as either party can then lay equal claim to being the party that ages the least. This is demonstration that one must consider the entirety of the cosmos, the imparter of inertial properties, to be the judge of the matter regarding actual motion. As another example of the hopelessness of using the space-time argument, consider that the renowned phycisist, John A. Wheeler, in his book Spacetime Physics, made three attempts to resolve the twin paradox and failed three times. After claiming to have solved it on page 131 of his book, he writes on page 170 that he will "finally! solve it". But he gets hopelessly stuck again. Wheeler was attempting to claim that the simple act of starting a watch as an inbound astronaut passes an outbound astronaut could make 162 years disappear on a distant planet (Earth). Realizing he has failed again, and in an attempt to salvage the discussion, Wheeler, in a footnote, refers his readers to an old journal article which he purports does solve the riddle of the time differential, obviously hoping no-one would actually look up the article. The article is "The Clock Paradox in Relativity Theory", American Mathematical Monthly, January 1959. See pages 9 and 10 of that article. Even though its author, Alfred Schild, in his informal and incorrect verbiage, feels compelled to claim "acceleration" for the returning twin, Schild in fact, in his diagram and math, specifies an instantaneous turnaround "at the event C", and of course cannot provide any explanation for the ultimate time differential. It is simply the precise nonsense that Wheeler had just twice engaged in and was defeated by. Until one acknowledges that a clock's rate is dependent on its actual (albeit experimentally indiscernible) state of motion, one cannot explain the time differential between reunited clocks. Only an actual difference in clock rates can bring about the actual difference in clock readings which exists between reunited clocks. The time registered on a person's clock is dependent on the combination of their speed relative to light speed and distance covered in absolute terms. The time contraction formula is not linear. Thus, the party that changes inertial frames will be the party whose clock registers the least time over the course of a "round trip". This is seen with clarity when everything is charted out in absolute terms. Using a rational measuring paradigm, whereby the parties of different inertial frames check each other's clock status with the regular sending of radio signals, a noted asymmetry in time keeping differences between A and B builds incrementally, with the asymmetry being first noted at the moment of B's turn-around. Actual time-keeping fluctuation, in conjunction with actual length contraction and actual states of uniform linear motion, produces all the effects of special relativity as we know them in Einstein's treatment. Such actualities imply an absolute frame of reference, albeit an experimentally indiscernible one. It is meaningless to ascribe linear motion to the whole of the universe itself, considering that the universe is the baseline by which linear motion acquires meaning. Although the universe is expanding, special relativity easily holds true at any conceivable scale of distance at which we might test the theory. The notion that there is no absolute frame of reference or actual differences in clock rates has caused widespread wonderment and confusion among physicists, who regularly state that the mutual measured effects of relativity, along with the "relativity of simultaneity", are confounding, deeply mysterious, and impossible to understand. No shock or outrage to our common sense is to be found in the context of the universal frame of reference, and there is nothing we need to �learn to live with.� We would be shocked only to learn that there is no time differential between reunited clocks. Without such concept of an absolute frame of reference, one is left with a clock paradox of ones own making, which cannot be resolved in any rational manner. One is also left with no means to account for the symmetrical assessments across inertial frames as we know them in relativity. The eminent physicist John A. Wheeler, writes in Spacetime Physics that relativity of simultaneity is "strange" and "difficult to understand". Yet, Einstein's definition of simultaneity can be easily diagrammed against the rest frame of the universe. In Relativity Trail, the mutually measured effects of Einstein's special theory of relativity are explained with simple diagrams and arithmetic arising from an absolute frame of reference - a system at rest with respect to the totality of the universe. Einstein's entire treatment of special relativity - most notably his clock synchronization method - can easily be diagrammed against that stationary frame of reference from the God's eye view. And as noted, such frame of reference cannot be experimentally detected by entities in the universe. Einstein's definition of what constitutes a synchronization of two spatially separated clocks of the same inertial frame amounts to a disregard of an analytical incorporation of an absolute frame of reference. 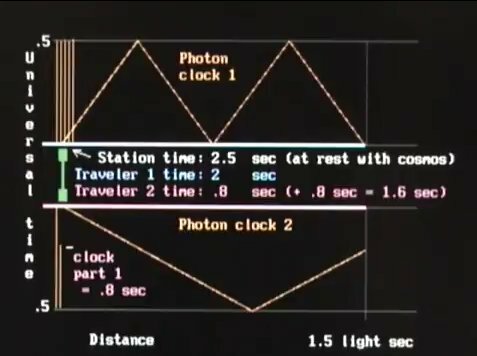 The two treatments (Einstein's and Relativity Trail's) vary, in large part, by the manner in which two spatially separated clocks of the same inertial frame are set. In his treatment, Einstein utilizes inertial frames to which he arbitrarily assigns the status of "stationary" and "moving". His definition of what constitutes clock synchronization makes an absolute frame of reference superfluous. Hence, Einstein's treatment does not address the question of which clock is actually running slower or faster over any interval of the analysis, nor, identically, the question of which entity's measuring rod is actually shorter. Symmetric assessments across inertial frames are assumed, without any diagramming of the process. In the course of Einstein's derivation, certain measures must simply be assigned to the entities involved for the sake of satisfying Einstein's postulates of measure. In the end, Einstein concludes that there is a time differential between reunited clocks, but with the absolute frame of reference neutralized by Einstein's clock synchronization, he cannot explain the missing time. Why is it called a paradox? As we noted at the beginning of this document, Einstein's relativity is almost universally treated as though it precludes any actual difference of length and clock rates between different inertial frames. This leads immediately to the state of mind that "there is no truth of the matter" concerning inertial frames. That in turn, creates a seemingly paradoxical situation - two reunited clocks do show an actual difference in recorded time, as if there must have been a "truth of the matter" regarding their clock rates as they moved uniformly. But Einstein's treatment does not preclude such actual differences of clock rates. In fact, his postulates demand it, as he should have noted at the conclusion of his derivation. By extension of logic, the famous experiments performed around the turn of the century which drove Einstein's postulates also demanded it. At the conclusion of Einstein's kinematical section, where he noticed the "peculiar" time differential between reunited clocks, he should have realized that his clock synchronization was obscuring the reality underlying the symmetrical measures across inertial frames. That does not mean that Einstein's special relativity is not valuable. Einstein's treatment succeeds in predicting observations of electrodynamical phenomena. When presenting relativity from the God's eye view, it is obvious that there is no clock paradox. From the God's eye view, light is seen to have a constant speed in an actual, not merely measured, sense. Thus Einstein's second postulate is so replaced. An actual difference in clock rates follows immediately from this postulate of the absolute nature of light, provided of course, that one assumes that photons are the maker of every relationship (specifically here, the regulators of atomic functioning; but also the carriers of force information and our means for perceiving events). The consideration of photons being massless particles, along with the consideration that mass and energy are interchangable, serves as the basis for postulating that light has an absolute speed and is also the limiting speed, with the photon having the property of existing in the form of pure energy. The preceding properties of photons and matter were actually known prior to Einstein's theory. Einstein himself introduced the notion of light existing in the form of a quanta of energy. Einstein's first postulate, which itself pertains only to measures of properties, is the Principle of Relativity extended to electromagnetism. As seen in the Michelson-Morley experiment, as well as in Galilean mechanical demonstrations, the Principle of Relativity is inextricably bound with synchronization of motion along different axes. It is replaced, in the Gods' eye view, with the requirement of actual synchronization at the base of our physical structures, for the sake of their stability. The Machian notion of a particle's relationship to totality, along with absolute light speed, combine with the need for atomic synchronicity to explain actual length contraction of rigid bodies. This is because photons (or virtual photon events) are considered to be the fundamental agent of communication within atoms, maintaining the organized structure of the atom. It is the equivalent of the Michelson-Morley paradigm, but on the atomic scale. Implicit here, is that particles have both a translatory relationship with the universe, and a rotational/orientational relationship with their translatory path, in the Machian sense. When light rays and the motions of objects, along with their photon clocks, are charted out against the stationary reference frame of the God's eye view, all the mutual effects of special relativity fall into place, including of course, consistently measured light speed in all directions, in all inertial frames. There is no clock paradox from such a vantage point. It is seen with clarity, why it is that the clock whose change of inertial frame brings the clocks back together is the one that records the lesser time over the course of the round trip. Symmetry of Measuring with diagrams and math. Twin Paradox Analysis with diagrams and math. The same links are found at the bottom of this page. No aether need be considered in such a treatment, rather a structure which is made up of an evolving set of relationships between all elements of the universe, in keeping with the nature of general relativity. Light is the maker of every relationship in this structure. The photon (or virtual photon event) is the agent of communication, both of forces, and of positioning information. This structure is not fixed, rather evolving. The sum total of the structure, identically with its point or points (as in the inflation case) of departure is regarded as being at rest. The description of this structure most simply incorporates the notion of a point of departure (the Big Bang) within the spatial dimensions of a Euclidean universe. No meaning can be attached to any movement of such a point of departure. But in the context of the notion of a universe of inflation, Euclidean or non-Euclidean, the description is fundamentally the same. In this latter case, the origin of the universe lies outside its spatial dimensions, and the membrane of space expands due to inflation along that other dimension. There are then any number of points of departure for motion with respect to the membrane of space. In this latter case, it is obvious there would be no single center point of the universe within its own spatial dimensions. But even in the former simple case, such an actual center point would be experimentally undetectable. This is detailed in Relativity Trail. structure of space - the aether. satisfy the Principle of Relativity. Although the twin paradox is strictly an effect of special relativity, where no inertial force is involved, consider that A. P. French writes on page 150 of Special Relativity: "Note, though, that we are appealing to the reality of A's acceleration, and to the observability of the inertial forces associated with it. Would such effects as the twin paradox exist if the framework of fixed stars and distant galaxies were not there? Most physicists would say no. Our ultimate definition of an inertial frame may indeed be that it is a frame having zero acceleration with respect to the matter of the universe at large." In Mach's Principle, an object is affected by a change in motion relative to the matter of the universe at large. But such an effect cannot occur unless the object is in a relationship with the matter of the universe at large regarding its initial state of motion to begin with. Remember, an effect due to a change in motion is not simply an "either or" effect, rather it is an effect of degree based on "degree of change". No effect of degree stemming from a degree of change can occur unless there is an effect based both on initial state of motion and final state of motion. Put another way, a change in motion in the context of the universe is not meaningful without an initial and final state of motion in the context of the universe, and both those states are necessarily uniform states of motion. Mach himself regarded the matter of the universe at large to be an actuality, and the effect on the object to be actual. We can't have it both ways. If the matter of the universe at large is a reality which has an actual relationship with an object concerning a change in motion, then so too is it a reality which has an actual relationship with an object concerning motion itself, i.e. - the initial and final state of motion, related to each other by the act of change in inertial motion. And again, our observations (measures) are something fundamentally different from the underlying reality - a reality which generates our observations (measures), which can occur only at light speed. In SR, Einstein was able to make an absolute frame of reference superfluous by postulating only the constant measured speed of light. In GR, he made Mach's Principle (somewhat) superfluous by again holding to only a postulated measured speed of light. A spatial seperation between two objects can actually be achieved, rather than merely seem to be achieved. Thus, there actually is relative motion. One can relocate oneself relative to ones house can one not, by traveling from the living room to the kitchen? Can one not relocate oneself relative to the universe by traveling through it? Thus, there actually is motion relative to the universe. My house actually exists, even though it is not perfectly rigid. I can actually move relative to my house, despite the fact that all the sub-atomic elements of which my house is comprised are moving about relative to the overall structure of my house. I can actually travel from one end of my house to the other end. And in so doing, I affect the motion, relative to my house, of each individual element of my house. The universe does actually exist, rather than merely seems to exist. After all, how can you agree that there is actually relative motion, agree that there actually is a universe, but not agree that there is motion relative to the universe. All the elements of the universe are moving about relative to the overall universe, just as with my house. Also, one obviously does not need to be at the barycenter of the universe to be at rest with the sum total of the universe. You don't need to be at the center of your house to be at rest with the sum total of your house, do you? Light, being massless, has a constant and maximum speed as it moves through the universe, and all objects move at some fraction of that speed, the speed by which all other speeds must be defined. If the speed of light is real in a real universe, then the speeds of objects are real in a real universe. Twin Paradox Animation on youtube. Similar textual content as found on current page. Twin Paradox Explained. A similar discussion of the failure of space-time diagrams. Symmetry of Measuring. Diagrams and equations demonstrating the symmetry of clock rate and length measures across inertial frames. Twin Paradox Analysis. Diagrams and equations demonstrating the symmetry of measures and time differential regarding case 1 and case 2. Twin Paradox Animation. Embedded youtube animation, with textual description.